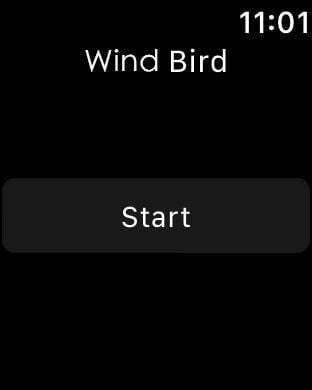 - WindBird is an app that communicates with wearable activity trackers (Apple Watch ) in real-time and utilizes the data received from its inertial measurement units as inputs to the game. You can play the games with three exercises: running, cycling or rope skipping to control the movements of the game character in real-time. - For running and cycling we suggest a phone mounted in front of the a treadmill/bicycle while exercising, and for rope skipping we recommend casting the phone screen to a TV to make sure you can easily see the screen while jumping. - The story of the game is based on a bird that has fallen behind its flock. The objective is to regroup with the flock before time runs out and before the flock reaches its destination. There are also physical and environmental parameters that may affect the movement behavior of the bird and flock, go find it out during exercise! The game features a mission-based structure and point-based system. Higher levels can be unlocked when missions have been achieved. The achievement system included, plus multiplayer mode brings in leaderboard and challenge boxes that allows players to compete with each other. - An Apple Watch is required to actually interact with this game. but you could give it a try without any of them, by just tapping the screen.